Wins of Fortune Slot is an entertaining online slot machine available on Vegas Spins. It features a legendary hero and some mystical characters across the 5 reels and 76 to 259 ways to win. Produced by the software maestro – Quick Spin, it showcases some visually stunning graphics. Join in the Chinese theme adventure to stand the chance for some huge wins! 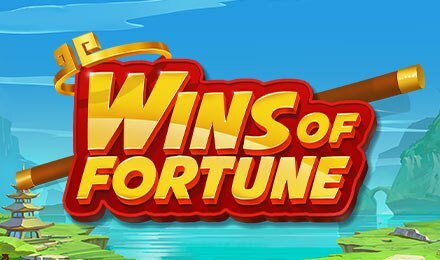 To jumpstart your spinning adventure on Wins of Fortune Slot, check out all your betting options and adjust them according to your preferences, You will find a waterfall of awesome symbols such as 5 different and colourful gemstones and the mythical protagonists: Sun Wukong and Zhu Bajie. Sun Wukong is the highest paying symbol and it can bestow you with 50 coins in the event you get 5 on a win line. Bet Levels: If you are in search for the Bet Levels, well there are none! Amount of Paylines Selection: Wins of Fortune Slot is a 76 to 259 ways to win and they all remain active! Coin Values: No coin values! You will spot the Bet Values which consists of the following: 0.20, £0.40, £0.60, £1.00, £2.00, £4.00, £6.00, £10.00, £20.00, £40.00, £60.00 and £100.00. Do you spot the wild symbol on Wins of Fortune Slot? It is the rectangular icon that has the word WILD labelled on it! Any of your wins on Wins of Fortune Slot can trigger the Wins of Fortune Respin Feature. All the winning symbols will move a step to the left just as the grid of the game evolves. Then, all the remaining symbols will stay in place for yet another respin. All of your wins during that feature will be paid for each respin and this will carry on until there is not a single win. During the Super Respin Feature on Wins of Fortune Slot, the sky will change colour by turning red and it will start as soon as the game attains the full 5x5 grid. Now, every winning icon will remain in place and this game will re-spin until there is no additional winning icon on the grid.